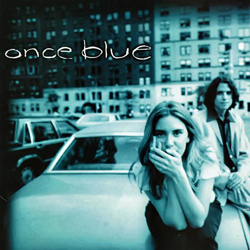 Many moons ago, in the mid 90s, I was a part of a group called Once Blue, led by the singer Rebecca Martin, with whom I made my first albums for EMI. The first one came out in ‘95, and we toured behind it for a year. The second one was recorded at the end of ‘96 and never came out, except in Japan a few years ago, appearing as the 9 bonus tracks to the release of the re-mastered original album. That version is what I would call “The Complete Once Blue,” containing over 20 songs. At last, after nearly 15 years, for the first time ever in the US, it is available on iTunes. That second album, which begins at track 13 “The Endicott,” was thought for a long time to be lost forever. We had been dropped from the label before ever doing the final mixes and later did not have possession of the masters; besides, it never seemed practical to bother, since the group ceased to exist. But in 2002, our former management, going out of business, offered to give us back all our old reels and DAT tapes, of which there was one single DAT of the second album’s rough mixes. They sounded incredible, bolstering the perennial argument that “the rough mixes are better.” These are what appear on this release, and there are some classic gems among them, if I may so myself! For example, Kurt Rosenwinkel’s guitar solo on “Shadow Of A Bird” is simply brilliant and continues to mesmerize me time and again.